Spaceport NewsAmericas gateway to the universe. Leading the world in preparing and launching missions to Earth and beyond.February 13, 1998 John F. Kennedy Space CenterVol. 37, No. 3 Mission Update Mission Update STS-89Back home The orbiter Endeavour and its seven-member crew touch down on KSCs Shuttle Landing Facility, Runway 15, at 5:35 p.m. EST, Jan. 31. Below, returning astronaut/cosmonaut researcher David Wolf prepares to depart for Houston the following day. Wolf completed 128 days in orbit, including 113 aboard the Russian Space Station Mir. Endeavour was reported to be in good shape following the nine-day STS-89 mission. On dock Checking in at 7,500 pounds less than its predecessor but looking much the same, the super lightweight tank is now at KSC. Above right, Bren Wade, chief mate of booster retrieval shipLiberty Star, was among the crew that helped bring the new tank to Florida by barge (shown here) from the manufacturing plant in Louisiana. High winds and stormy weather kept the barge at Port Canaveral for several days, with delivery to KSC completed Feb. 6.Super lightweight tank The 1998 KSC All-American Picnic will be held Saturday, May 16, from 10 a.m. to 4 p.m. at KARS Park I. Tickets will go on sale approximately two weeks before the event.Spacelab gives way to International Space Station eraOn Feb. 4, a symbolic door closed on one of the most successful chapters in Shuttle program history. For the last time, a Spacelab module completed preflight preparations in the Operations and Checkout (O&C) Building and was installed in the payload canister for transfer to the Orbiter Processing Facility. This phase of the Shuttle program is winding down as the second phase of the International Space Station (ISS) program gets under way. Microgravity and life sciences research that formerly was conducted in Spacelab modules will eventually be conducted inside the completed ISS. Its been a great program with a lot of great successes, observed Mike Stelzer, Spacelab/Experiment Phasedown lead for NASA at KSC. A ceremony was held Feb. 6 in the O&C high bay to honor the hardware, KSC workers, experiment scientists and astronauts who have helped make the Spacelab missions an integral part of the research conducted on the Space Shuttle since the first Spacelab flight in 1983. Attending were Roy Bridges, center director; Sterling Smith, acting manager, Payload Carriers Program Office; Bruce Melnick, Boeing, Payload Ground Operations Contract program manager; Dallas Gillespie, Boeing, deputy, KSC operations; and Tom Breakfield, formerly NASA KSC Payload Flight Operations director. This is another milestone in the history of human spaceflight, said Bridges, who flew as pilot on the third KSC All-American Picnic is May 16USA reducing work forceSpace Flight Operations Contractor (SFOC) United Space Alliance (USA) is reducing the size of its work force both here in Florida and at its Texas location. Spacelab module flight, STS 51-F in 1985. Bridges noted that Spacelab demonstrated the capability of conducting science in space for relatively long-duration missions. The program also led to the forging of international partnerships as each mission unfolded, setting the stage for the international participation As more information becomes available, it will be posted on a Web site linked to the KSC Internal Page, as well as in the KSC publications Countdown, Spaceport News, and the Bulletin. (See SPACELAB, Page 2) (See JOBS, Page 4) A SPACELAB module is transferred for the last time Feb. 4 from a test stand in the Operations and Checkout Building to the canister transporter. This module is configured as Neurolab, a life sciences research mission focusing specifically on the neurological system. Composed of the brain, spinal cord, peripheral nerves and sensory organs, the human nervous system is the most complex system in the body. 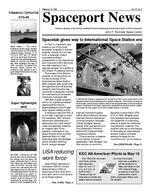 SPACEPORT NEWSFebruary 13, 1998 Page 2 that has defined the ISS program. Spacelab was designed by the European Space Agency (ESA) for the Space Shuttle program. There were two flight-qualified Spacelab modules, and a third module that was an engineering test module. ESA provided the first flight module, while the United States purchased the second. The Spacelab program also encompassed several other hardware elements: the Igloo, which provided onorbit support to unpressurized Spacelab hardware; the Instrument Pointing System (IPS) for precise pointing of telescopes; pallets capable of carrying scientific instruments in the orbiter payload bay; and the Mission Peculiar Experiment Support Structure (MPESS), also a type of payload bay carrier. Including the 15 flights to date of the module, Spacelab hardware has flown in some combination or another on 42 Shuttle flights nearly half of the 89 flights in Shuttle program history through STS-89. Include the Shuttle-Mir missions that featured the Spacelab tunnel and the number goes higher.Multiple benefitsThe Spacelab concept of modular experiment racks in a pressurized shirtsleeve environment made it highly userfriendly and accessible. Numerous experiments conceived by hundreds of scientists on the ground were conducted by flight crews in orbit. Spacelab modules served as on-orbit homes for everything from squirrel monkeys to plant seeds. Pallets and MPESSs supported astronomical as well as Earth observations, for servicing the Hubble Space Telescope and for research preparatory to the International Space Station, such as the Japanese-built Manipulator Flight Development (MFD) payload which flew on STS-85 last year. One of the greatest benefits afforded by the Spacelab missions was the opportunity to fly a mission more than once, with the second or third flight building on the experiences and data gathered from its predecessors. The laboratory-in-space concept yielded another innovation as well: The payload specialist, a crew member selected from the prinicipal investigator team for his or her expertise in a particular field related to a Spacelab mission. The concept in effect extended the researchers laboratory into space and allowed the investigator hands-on, realtime control over the experiments. Speaking at the ceremony, former astronaut Melnick noted that more than 98 per cent of all Spacelab mission science objectives were accomplished. The accomplishments of the team that processed Spacelab over the years also were praised at the ceremony. You are the secret ingredient, Bridges told the gathering. You work the magic to get it done on-time and right. We can all be proud that we worked on a program that lasted 20 years, said Smith, echoing Bridges praise. I think this team has plowed a lot of new ground, observed Breakfield. If the Shuttle-Mir docking flights represent Phase I of the ISS effort, then Spacelab was Phase 0, he said.Legacy will continueAnd while the primary purpose of the Feb. 6 ceremony was to honor an illustrious past, the legacy of Spacelab will continue into the ISS era as well as in other programs. Although the two flight modules will no longer fly in space, the Spacelab pallets and MPESSs will be used in the International Space Station program. The usefulness of Spacelab will manifest itself in other more subtle ways as well. Many of the advances and lessons-learned during the Spacelab era will be carried forward into the ISS program, such as: Telescience, involving researchers on the ground in remote locations controlling their experiments in space. An experienced KSC work force familiar with Spacelab hardware and the process of reflying a piece of payload hardware more than once. We got a lot of experience from Spacelab that will help with ISS, noted Tracy Gill, NASA Experiment Integration Electrical lead. We know how to handle the hardware and fix things. Spacelab has been a great building block for the payload team. Boeing Technician Terry Camarata can testify to that. Camarata joined the payload team at KSC in 1979. He remembers working 44 days straight to get the first Spacelab module flight, STS9, ready to fly in November 1983. Camarata worked in the Automatic Test Equipment control rooms in the O&C, from which Spacelab hardware could be checked out prior to flight. He now has a similar job with the Test, Control and Monitor System in the SSPF, checking out station payloads on the ground before they fly in space. Although he hates to see Spacelab phase down, Camarata notes the tremendous technology advances that have been made since Spacelab was first conceived. Equipment and hardware that saw its infancy on Spacelab flights, like the Japanese MFD (a type of robot arm), will eventually be used on the space station. In fact, the flight schedule for the pallets is actually more intensive in the ISS era, Smith pointed out. The pallets lend themselves to logistics missions, and a lot of the ISS flights will be focused on ferrying materials from here to orbit, he said. Three of the 10 Spacelab pallets are now in the Space Station Processing Facility, with one already being used to support the third U.S. ISS assembly flight. Two others are at Goddard Space Flight Center supporting Hubble, and the remainder are in the O&C. In coming years, the pallets will also support non-ISS science missions as well. The MPESSs also are available for flight, although none are currentlySpacelab ...(Continued from Page 1)THE Spacelab commemoration ceremony in the O&C Feb. 6 featured a Brevard Symphony orchestra quintet and four speakers, including Center Director Roy Bridges, against the backdrop of the American flag, a banner hailing Spacelab as the pathway to the International Space Station and the payload canister transporter holding the STS-90 Neurolab module. At the end of the ceremony, the doors on the canister were shut completely for the last time on a flight-ready Spacelab module. Transfer to the Orbiter Processing Facility was slated to occur Feb.11. SPACEPORT NEWS February 13, 1998 Page 3 The NASA Kennedy Management Association (NKMA) is pleased to announce that it intends to award scholarships in the minimum amount of $500 each, to promote educational opportunities for high school seniors, college, and vocational school students who are academically talented and who have demonstrated a commitment to excellence. Applications can be downloaded from the NASA homepage located at: http:// nkma.ksc.nasa.gov and are due March 6. In order to qualify for the scholarship, the applicant must be a KSC active civil service employee, or the spouse or dependent of an International Space StationAmazing factThe solar panels on the station will be the largest ever built about 100 feet long to provide the electrical power needed to operate the station on-orbit. Sixteen of these solar panels must work in concert, while massive arrays constantly track the sun and distribute 110 kilowatts of electrical power through a vast network of batteries, relays and distributors. Boeing fact sheetFlight STS # # Payload Carrier Launch 1 2OSTA-1pallet11/12/81 2 3OSS-1pallet03/22/82 3 7OSTA-2MPESS06/18/83 4 9SPACELAB-1module, pallet11/28/83 541-DOAST-1MPESS08/30/84 641-GOSTA-3, LFC, ORSpallet, 2 MPESSs10/05/84 751-ASRM2 pallets11/08/84 851-BSPACELAB-3module, MPESS04/29/85 951-GSPARTAN-01MPESS06/17/85 1051FSPACELAB-23 pallets07/29/85 1161-ASPACELAB-D1module10/30/85 1261-BEASE/ACCESSMPESS11/26/85 1361-CMSL-2MPESS01/12/86 1451-LSPTN-HALLEYMPESS01/28/86 1535ASTRO-12 pallets12/02/90 1640SLS-1module06/05/91 1742IML-1module01/22/92 1845ATLAS-12 pallets03/24/92 1950USML-1module06/25/92 2046TSS-1, EOIM IIIpallet, 2 MPESSs07/31/92 2147SPACELAB-Jmodule09/12/92 2252USMP-12 MPESSs10/22/92 2356ATLAS-2pallet04/08/93 2455SPACELAB-D2module04/26/93 2558SLS-2module10/18/93 2661HST SM-01**pallet12/02/93 2762USMP-22 MPESSs03/04/94 2859SRL-1pallet, MPESS04/09/94 2965IML-2module07/08/94 3064LITE-1pallet09/09/94 3168SRL-2pallet, MPESS09/30/94 3266ATLAS-3pallet11/03/94 3367ASTRO-22 pallets03/02/95 3471SL-Mmodule06/27/95 3573USML-2module10/20/95 3675TSS-1R, USMP-3pallet, 3 MPESSs02/22/96 3778LMSmodule06/20/96 3882HST SM-02pallet02/11/97 3983MSL-1module04/04/97 4094MSL-1module07/01/97 4185MFDMPESS08/07/97 4287USMP-42 MPESSs11/19/97 4390NEUROLAB*module04/02/98 44101SRTM*pallet09/16/99 45103HST SM-03*2 pallets**12/02/99* These missions have not yet launched. ** For the HST Servicing Missions, a pallet was given to the HST program, and is no longer part of Spacelab inventory. However, on HST SM-03, an additional pallet has been loaned to the HST program, and is expected back after the mission. NKMA offers scholarshipsemployee. Questions about scholarships and additional applications may be directed to Maria Lopez-Tellado, MM-H, at 867-2133. Shuttle missions carrying Spacelab hardwareSexual harrassment training to be held Feb.18 instead of Feb. 16The second of two sexual harrassment training programs for civil servants will be held Feb. 18. The Feb. 16 date previously provided was incorrect. The program is being held in the Training Auditorium on Feb. 18, from 1:30 p.m. 3:30 p.m. The first program was held Feb. 11. The training is being offered to all NASA/KSC employees, and is mandatory for managers and supervisors. Director for a daymanifested. The three Spacelab modules will find new homes on Earth rather than in space. One will go to the Smithsonian Air and Space Museum in Washington, D.C. The fate of the other two will be determined through the Spacelab educational program created by NASA Headquarters, said Bob Dorian, NASA KSC Flight Systems Program manager.EXPLORING OPTIONS Astronaut High School Senior Jason Rodgers took advantage of Brevard Countys School-to-Work Program Feb. 4 to learn more about the responsibilities of the KSC director. Here, Rodgers (second from right) and Center Director Roy Bridges (right) meet in the Operations and Checkout Building with Darcy Miller, project engineer, Payload Processing (left) and John Lekki, lead electrical engineer, Payload Processing (behind Miller). The Schoolto-Work program encourages students to spend a day in the workplace shadowing a professional in their chosen field. In addition to learning about a portable data collection procedure system from Miller and Lekki, Rodgers also got some insight into Bridges daily schedule as head of KSC. Given Rodgers choice of Bridges a retired Air Force major general as the professional he wanted to shadow, perhaps its not surprising that the Titusville student will be attending the Air Force Academy after he graduates.And the O&C, which has been supporting human space flight since the 1960s, will also continue to have a useful life. ISS truss acceptance testing will be performed in the O&C high bay, noted Debbie Bitner, NASA Payloads Manifest and Multiflow manager. Other ISS hardware will come through here as well, including some test equipment currently housed at Marshall Space Flight Center, she said. John F. Kennedy Space Center Managing editor. . . . . . . . . . . . . . . . . Bruce Buckingham Editor. . . . . . . . . . . . . . . . . . . . . . . Paula Shawa Editorial support provided by Sherikon Space Systems Inc. Writers Group. Photographic support primarily provided by The Bionetics Corp. and Public Affairs Photographer George Shelton, also of Bionetics. USGPO: 532-112/20065Spaceport News The Spaceport News is an official publication of the Kennedy Space Center and is published on alternate Fridays by the Public Affairs Office in the interest of KSC civil service and contractor employees. Contributions are welcome and should be submitted two weeks before publication to the Media Services Branch, AB-A. E-mail submissions can be sent to Paula.Shawa-1@ksc.nasa.gov SPACEPORT NEWSFebruary 13, 1998 Page 4 The reduction is part of a continuing effort to reduce Shuttle operating costs and achieve greater program efficiencies. About 557 USA workers will have left the center by Feb. 20, 194 of them voluntary and 363 involuntary. The cuts were across-the-board in order to maintain the right skill mix among the remaining workers. About sixty USA workers in Houston are being let go. Once the KSC layoffs are complete, there will be 5,330 USA employees supporting ground operations in Florida. The USA layoffs and unrelated but ongoing civil servant buyouts continue the trend of a declining work force at KSC. Since return to flight in 1988, the contractor and civil service population at the space center peaked in fiscal year at 19,088 people, with 12,915 of them on-site contractor and 2,571 civil service. By the end of last year, the civil service population at KSC had declined to 1,820 workers. The most current figure available on contractor work force size is from calendar year 1996, when there were 9,518 on-site contractor employees at SENIOR DELEGATION Many senior government officials who participated in a Jan. 29 International Space Station signing in Washington, D.C., took advantage of the opportunity to see the hardware including Node 1, behind them in the Space Station Processing Facility at KSC the following day. The 1998 Intergovernmental Agreement on Space Station Cooperation establishes the framework of cooperation among the partners on the design, development, operation and utilization of the station. State Department official Strobe Talbott was the U.S. signatory. Also participating were representatives of Russia, Japan, Canada, and participating countries of the European Space Agency (ESA), including Belgium, Denmark, France, Germany, Italy, the Netherlands, Norway, Spain, Sweden, Switzerland, and the United Kingdom. Three bilateral memoranda of understanding also were signed. The new agreements supersede previous space station agreements among the United States, Europe, Japan and Canada signed in 1988, and reflect changes to the program resulting from significant Russian participation as well as program design changes undertaken by the original partnership in 1998. NASA Administrator Daniel Goldin is at front, center.VIP tourJobs ...(Continued from Page 1)KSC and a total work force of 14,520 people. USA is trying to do as much as possible to help the laid-off workers find new jobs elsewhere, and The Boeing Co., one of the alliances parent companies, is advertising positions on Cape Canaveral Air Station as well as in Houston. We are making every effort possible to assist our colleagues through this difficult time, said USA President and Chief Executive Officer Paul Smith. A job fair was held in both Florida and Houston Feb. 10 12, and USA has established a Career Transition Center at its Titusville facility. Job counseling, resume preparation, fax machines and contact with job services and unemployment offices are among the services offered. Boeing has indicated it foresees the creation of 150400 job openings in Houston and Florida. About 150 openings supporting the Delta launch program in Florida are anticipated, and more openings supporting other Boeing work are expected due to annual turnover. Boeing has set up an electronic database to accept applications and resumes over the Internet. The address is: http://www.resjobs.com/boeing Honoring Explorer ILARGE crowds turned out for the Explorer I 40th anniversary celebration Jan. 31 at the U.S. Air Force Space and Missile Museum on Cape Canaveral Air Station. As speakers broadcast simulations of radio programs announcing the launch and the final countdown, attendees watched a model rocket launch, visited displays and took in the sights of the museum, including the Complex 26 facilities from which the launch took place.